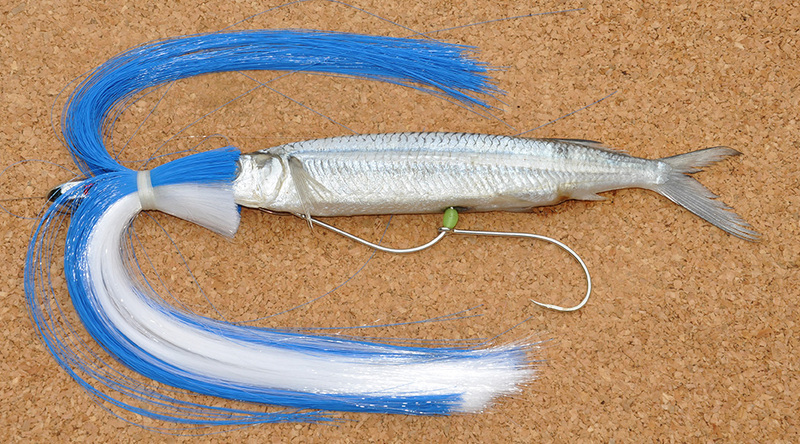 This ballyhoo trolling rig is intended for mackerel and wahoo, but billfish and tuna will clobber it too. 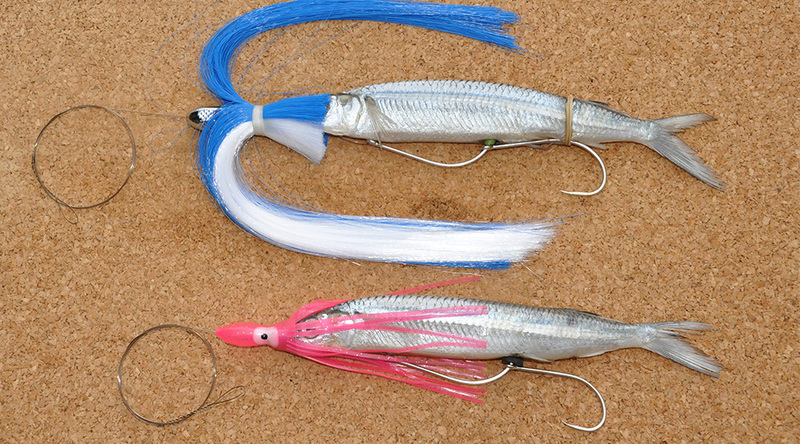 The weighted lure at the front of the bait takes it below the surface, while the skirt offers some additional attraction -- especially if the tail of the ballyhoo has been chopped off and the fish has missed the hooks on the first pass. To rig it you will need a ballyhoo, Mackerel Wog or similar weighted skirt, bait spring, #8 or #9 single strand wire, two Gamakatsu SL12S hooks to suit the size of the bait and a soft lumo bead or rubber washer. Text and photos by Glen Booth. Prep the ballyhoo prior to rigging. Remove any loose scales and empty the stomach by running your thumb down the belly. Gently squeeze the flesh between the thumb and forefinger to loosen the backbone but without splitting the skin, and then give the ballyhoo a couple of gentle bends in both directions. 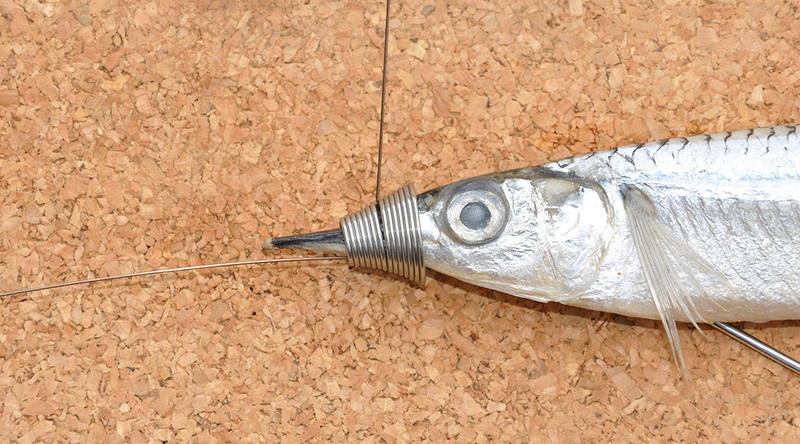 Cut 3 feet of wire from the roll, form a haywire twist at one end, then slide on the lure and bait spring. Gang both hooks together, with the point of the first hook facing upwards and the second one down. The SL12 hooks have quite small barbs, so use the soft lumo bead or a small rubber washer to prevent the second hook sliding back off. Attach the hook gang to the wire with a haywire twist, finishing it with the tag end pointing up the same way as the point of the first hook. Lay the rig next to the bait, lining the tag end up with the upper and lower jaws, noting where the bottom of the bend of the first hook lies. This is where the hook point will enter the belly. 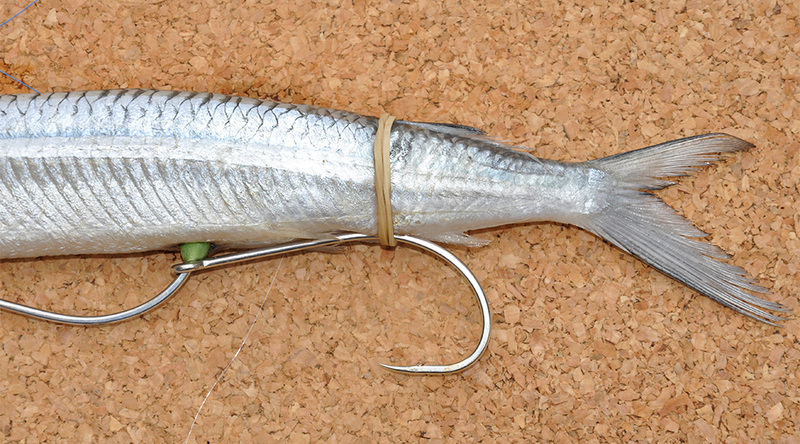 Place the hook in the center of the ballyhoo's belly, pushing it all the way up to the bend, and then push the tag end of wire up through both jaws. 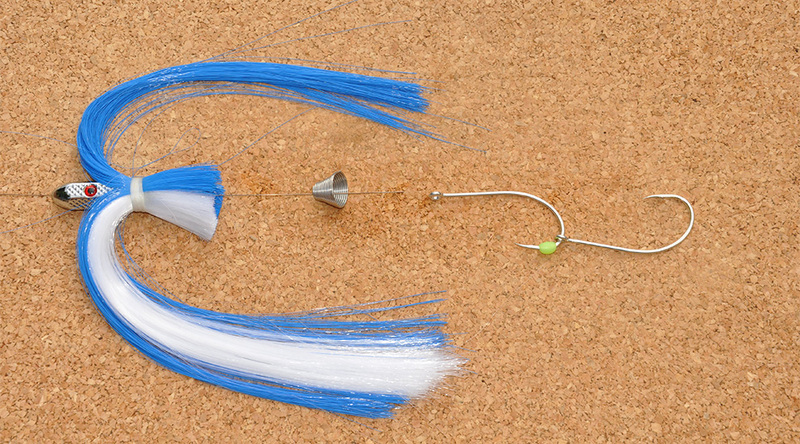 Slide the bait spring down to the wire tag and twist the spring into location. Remove the tag if necessary. 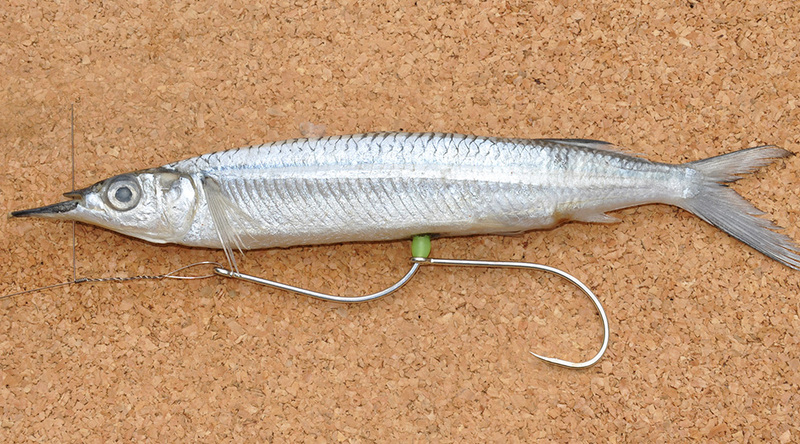 Slide the lure down over the bait spring and the rig is complete. It looks like a bit of a hairy mess right now, but when in the water the skirts will fold back, and pulse and breathe very seductively. Should the target species be holding deep on a peak, knock the boat out of gear and let the rig sink for a few seconds. Put the boat back in gear, and as the ballyhoo begins to move, get ready for a bite! IGFA rules state that when fishing with natural bait, both hooks "must be firmly imbedded in or securely attached to the bait." 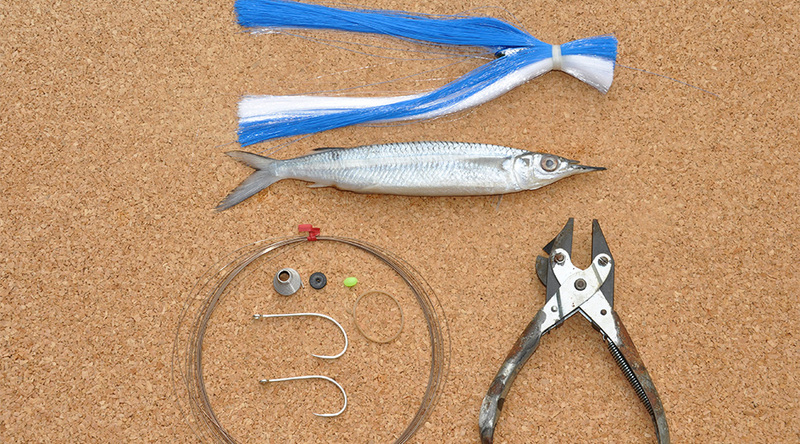 Consequently, the second hook must be fixed to the bait by a rubber band, a loop of waxed thread or even a small cable tie. Unfortunately, this does dampen the bait's action. 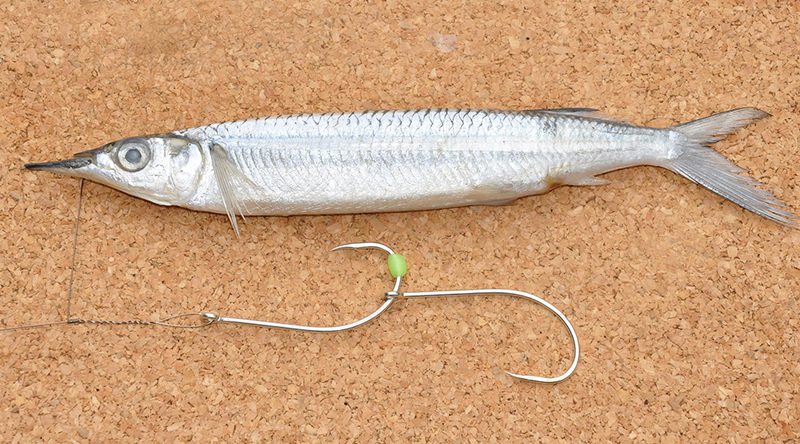 Alternately, both hooks can be ganged in-line and the points positioned in the bait, although this is not as effective. If just fishing for fun, leave the second hook free-swinging. 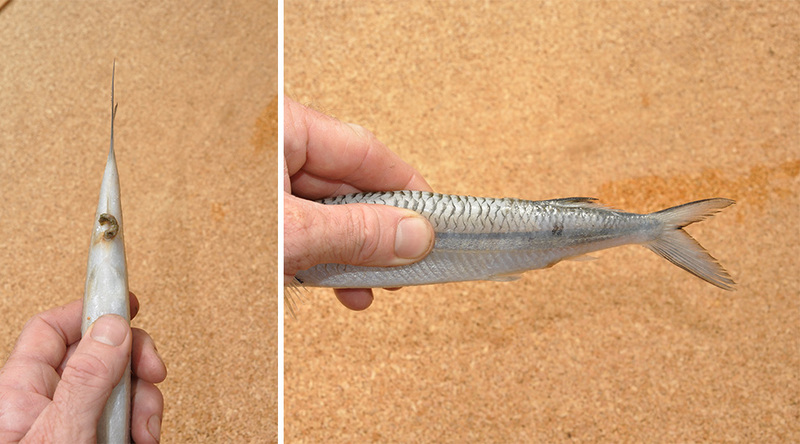 This rig can also be used as a skip bait by dispensing with the weighted lure and replacing it with a pink squid.